Want to know how to boil crab? And how long to boil crab? You have come to the right place. Crab-O-Licious.com will show you the in's and out's of boiling crab and if you have any other questions about it, you can get them answered here, too! We have a new feature down below for live comments, so we can help you better! Now, may you know that boiling crab is basically for the processing of whole crab that hasn't been previously cooked. Some people like to clean crab first, which is fine, then go to cooking crab and eating them right away. However, others like to freeze the whole crab and process it later, which is fine, too, but the crab needs to be boiled first. Some believe that boiling the crab and freezing it whole helps preserve the fresher taste of the crab, then, steamed at a later time than freezing just the crab legs. Either way works just fine, it's really a matter of personal choice. A big pot, depending on how many crab you have to boil. 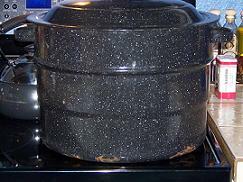 A pot, like the picture above, can hold 2 good size whole crab. The picture below shows what I use when we catch a lot of crab. It's an old canning pot and works great for getting a lot of crab boiled fast. Salt or Sea Salt, which ever you prefer. Our preference is Sea Salt-course. You want boiled crab legs, but you want them to be healthy to eat, too, don't you? A Pair of Tongs come in handy for handling the crab in and out of a hot pan with boiling water. Seasonings (optional) you can really give your boiled crab legs some zest with crab boil or other seasonings, like, Mrs. Dash or Old Bay Seasoning is real good! If this is your first time boiling crab legs, I would suggest using just the salt, then experiment when you boil crab again. You can find this some of these products in our Crab-O-Licious Store. Fill your pot to about 2/3's full of water, add salt (about 1/2 cup/gallon of water) and seasonings (optional/your choice), then, bring to full boil. Carefully add the whole crab to the water. Make sure the crabs are all covered in water. Boil them until the shells turn red, for approximately 20 minutes counting time after the water comes back to a full boil. They're done! Now, you can cool the crab down by either laying them out on a clean dry towel, like I have illustrated with dungeness crab. Or, you can cool them down by placing them in cool water in a clean sink. Either way is fine, but cooling them with cold water or even over ice is an excellent way to avoid the crab meat sticking to the legs. Now you are ready to clean the crab or you can eat the crab. We'll show you how to crack them and get their meat out. Now, you know how to boil crab! Still Got Questions About Boiling Crab? Do you still have questions about how to boil crab? That's alright! Ask away here...Also, you can check below this form and see if someone else came before you and answered your question for a quicker answer. If not, ask away and we will answer them in our next issue of Crab Clique. So, be sure to sign up for our newsletter! Killing Crab or Boiling Crab Which Comes First? STILL Have Questions About Boiling Crab? Need to know about cleaning crab, click here! We'll give you the in's and out's of cleaning crab, complete with a couple video's to help you. Check out our popular Crab Meat Recipes, here.